Portugal declared to use new reverses of euro coinage starting from 2008. Unfortunately a mint worker set by accident stamps of obverses 2008 with stamps of the old reverses and ca. 100,000 of such error coins entered the circulation. 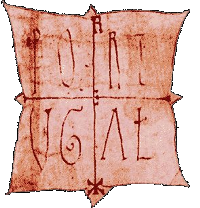 One of the seals of the first King of Portugal Alfons I from 1144.